Today we were visited by Joffre White, the author of the 'Frog' book series. 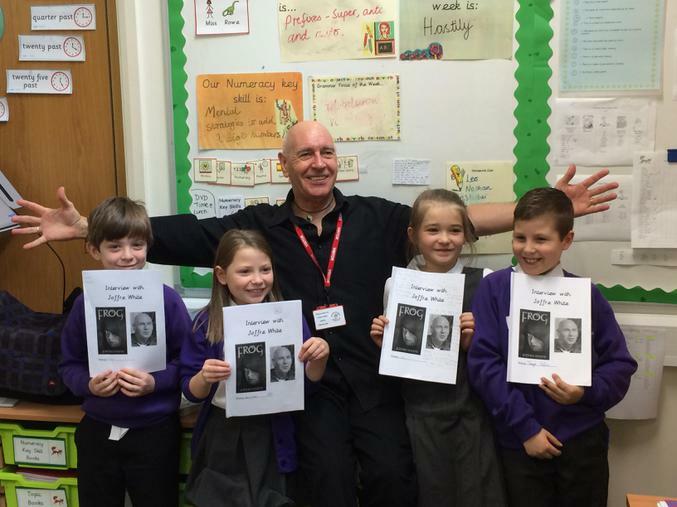 He spent the day working with Year 4 as part of a creative writing project, as well as being interviewed for their biography writing unit! Later in the day, Joffre held a Reading Motivators session for Years 3, 4 and 5 before signing copies of his book in the Cyber Cafe. This was a wonderful experience for the pupils, which they have thoroughly enjoyed. If you missed the opportunity to buy one of Joffre's books, or would like to find out more, you can visit his website. You can also see more pictures from the day in the Year 4 Gallery.